30 x 30cm oil and graphite on linen. I have a soft spot for Victorian era or olde worlde looking botannical illustrations. Now this painting is not strictly in that vintage style as I've aimed to loosen it up a bit with watercolour inspired brushwork. The result is rightly a bit more modern, while harking back to an older era where cucumbers were routinely eaten as a sole sandwich filling, and held in much higher regard than they seem to be today. Did you know that all the food painting artwork is available to own in the Official Art Store? If you want to get your mitts on the original, it is drying and awaiting it's professional photoshoot before being allowed in the shop. To be kept updated on available paintings, get on the mailing list, yellow box top left. It can be somewhat odd making soups in high summer, but sometimes that's exactly what you want to eat. Some people enjoy cold soups at this time of year. I don't enjoy cold soup at any time of year. I did, however, try this soup both cold and warm and I can say that it works either way. So if chilled soup is your thing then you can make this and put it in the fridge. If warm (not hot) soup is your preference, this is delightful. 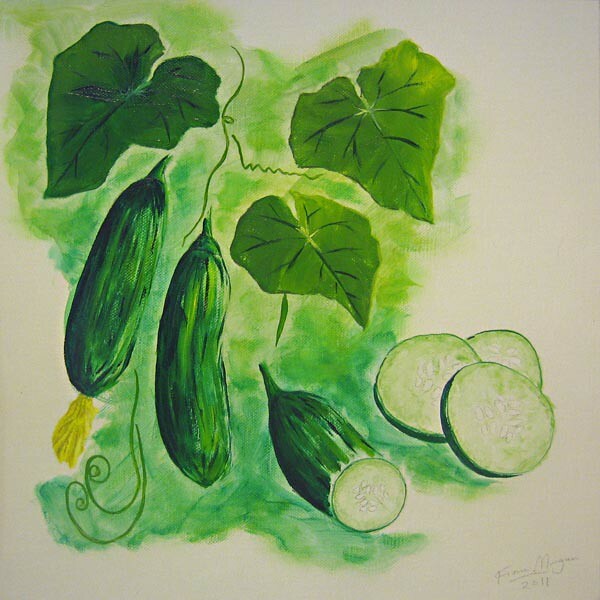 It also uses a good quantity of cucumber which I have discovered grows as prolifically as zucchini. Just so you know, not deseeding or peeling the cucumbers turns this into an entirely different and rather ordinary dish. I am generally not in favour of peeling and deseeding vegetables or of creating extra work in the kitchen. In this recipe it is essential. Peel, deseed then weigh your cucumber. It is absolutely worth it. Soften the spring onion in oil. Add grated/sliced cucumber, lemon juice, stock and dill. Heat until the cucumber is warmed through and softened. It doesn't need to be 'cooked'. Add avocado and white wine vinegar and puree until velvety smooth. Serve and garnish with more dill. Add salt and pepper to taste. A generous amount of pepper works well.